BrokeNCYDE is a group based in Albuquerque, New Mexico. The band consists of four members, Se7en (Lyrics/Production), Mikl (Hype/Vocals), Phat J (Synths/Backup Vocals), and Antz (Hype/Live Production). BrokeNCYDE was discovered by and is currently managed by The Artery Foundation, a team that has discovered other popular bands such as Alesana, The Devil Wears Prada, and Carnifex. 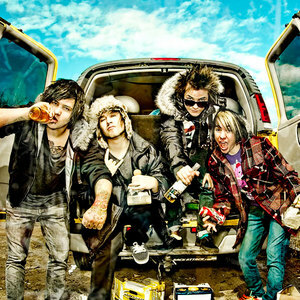 BrokeNCYDE released their first single, "Blue Steel" back in 2006, and it became a huge success. They followed with two other singles, "FreaXXX" and "Bree Bree". They are currently on a nationwide tour. Im Not A Fan, But The Kids Like It!